What an absolutely amazing rdta. I'd literally recommend it to anyone. My girlfriend even likes it and she doesn't vape anything but sub-tank. The top cap redesign is amazing as well. You should clarify it has been redesigned for the better. Just got my order in. Loving it.Thanks Subtank Supply. Thanks to Wendy Vapes for the recomendation. First, subtank supply is awesome. Shipping is super fast and everyone is nice and friendly. This tank is awesome when you can figure out how to wick it. I'm still trying to figure it out but i have to say, this company went beyond their abilities to make sure i was happy with the purchase. THANK YOU. This is a great RTA. It is my second one! My review here is going to be about the customer service. My tank came with a defective build deck (manufacturing issue not retail issue), I emailed them today regarding the problem and I got a response in minutes and they are sending me a new deck. 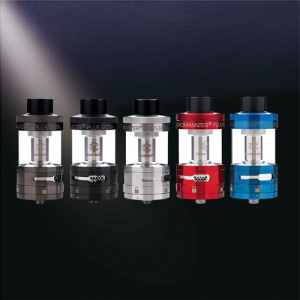 I have been an avid vaper for 4 years and have ordered from many many companies but sub tank supply ranks the highest for me! Hell yeah just got it!! Using it in 5ml mode and this tank is awesome!! Came nice and clean but washed it anyway, threw in an alien build and subohm'n away!!! Love it the only cons i found is the airflow ring tolerance is a little loose and the drip tip is really hard to remove even after juiced up. Other than that this is a must get tank!! I am very happy with this RTA. The flavor far exceeds any RTA that I have. It can be a little tricky at first to take apart and put together, but after a few practice runs before finally building on it, it wasn't too bad. The deck is a little small compared to the overall size of the RTA when it's put together. But the small deck produces some great flavor. I haven't experimented too much with it yet since I'm loving a simple Clapton build on it with the 5ml tank. The airflow is so easy to adjust, and no leaking issues whatsoever. Without a doubt my favorite large tank to date. Easy to build on, wicking is a little tricky but the rewards make it well worthwhile. I like this RDTA so much that I bought 3 of them. This is an amazing tank. I vaped on the ModFather RTA for the longest and I have to say this tank here puts the ModFather RTA to shame. Not only have I not had any leaking issues this tank has flavor for days. I love the postless design because I gave room to put a Hemi V8 engine on it if I wanted. If you are truly looking for a large 30mm RTA that has amazing flavor and amazing clouds that is easy to wick and nice to look at then I highly recommend this tabk I promise you wont regret it. I'm a huge vapor junky and this has become my #1 favorite tank out of the 52 tanks and drippers I own. The steam crave aromamizer plus is my favorite big tank to date. I love the postless deck I had some trouble setting it up at first but with messing around with it I was able to master it and getting the wicking right is a tricky but very well worth the effort to learn. Subtank supply was shipped same day I ordered and I got in 2 days. Lot better than ordering direct from steam crave and cheaper to get from them. If you have any questions you can text them here. I love that being able to get my question answered quickly and know I dealing with real people. I'm not a reviewer just leaving my experience about this tank. I recommend it and recommend this Company I buy all my rta from them.